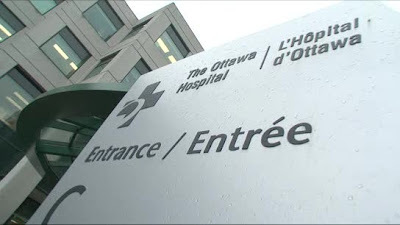 Weighty Matters: Ottawa Hospital finally follows through with cafeteria reform! Ottawa Hospital finally follows through with cafeteria reform! Yesterday, nearly 3 years after they first told the Ottawa Citizen they'd be initiating a nutrition labeling plan in their cafeterias, the Ottawa Hospital announced that point of service electronic calorie, sodium and fat content will be made available to customers. They'll also be implementing their own version of Health Check whereby a little green apple will signify meals they deem healthy.....er...sort of......well not really. Let me explain. Only two criteria will determine whether or not a meal will get a little green apple. Those criteria? Sodium content and total fat. Sodium content? That seems like a reasonable determinant to include, but unfortunately it would appear that the levels they adopted were those put forth by the Heart and Stroke Foundation's Health Check program. That means a large entree can have up to 960mg of sodium and a small 720mg. Given sodium's total recommended daily maximum is 1,500mg, that's an awfully generous "healthy" amount. Total fat? Again, probably a consequence of not building criteria from scratch but rather from existing, underpowered programs like Health Check and EatRight Ontario, the hospital's adopted total fat as an important nutritional determinant. Problem there is that it's not. The notion that total fat in one's diet is in and of itself responsible for the development of chronic disease or obesity has been soundly refuted over the course of the past decade or so of nutritional research. There's probably also risk in clinging to it. "The country’s big low-fat message backfired. The overemphasis on reducing fat caused the consumption of carbohydrates and sugar in our diets to soar. That shift may be linked to the biggest health problems in America today." So while I recognize the safety of working within the context of established programs, unfortunately if the established programs aren't in fact evidence-based, up to date, or nutritionally sound, the outcomes, while perhaps politically safe, may not be particularly stellar. I'm also confused by the notion of a check based on just two nutritional determinants of health. I'd argue that such a check is potentially worse than no check as it will undoubtedly confer a health halo to foods that may well be chalk full of calories, refined carbohydrates, sugar, and trans-fat. "So we're not saying they're healthy, they're healthier"
And while that may be the glass-half full version of looking at things, my glass-half empty version still maintains that "less bad" is not the same as "good", especially given the lack of any real criteria to reflect even "healthier", and the inherent risks associated with outdated, blindly low fat messaging. All that said, I'm thrilled there will be point of sale nutritional information provided, and that apparently there will be healthier options available. Here's hoping that given their will to launch the program, they'll also have the will to improve upon it. Stay tuned for a video tour over the coming few weeks, but for now, congratulations to the Ottawa Hospital for starting what I hope over time will prove to be a much more substantial initiative.